I have been fascinated for more than a decade by the Indian epic Ramayana, reading it in several translations and adaptations and pondering the lessons of the ancient poem. Over the course of four years I crafted musical interpretations of scenes/themes in the text. The first twelve of these comprise volume one of a two-volume project. You can listen to the songs by clicking on them below, or download a zipped folder containing the entire album. “Four Sons.” King Dasaratha, ruler of Ayodhya, is old and childless, though married to three beautiful women. Desperately yearning for a son, the king performs the Putrakameshti Yagna, a ritual sacrifice, seeking help from the gods. Hearing his plea, a god emerges from the holy sacrificial fire, bearing a bowl of payasam, a sort of gruel made with sweet milk, and asks Dasaratha to feed the mixture to his wives. The distribution of this payasam is interesting: upon receiving the substance, Dasaratha goes to his second, but favorite wife, Kaikeyi. She however urges him first to give a share of the payasam to Kaushalya, the senior queen. Dasaratha goes to Kaushalya and leaves half the payasam with her, returning immediately to Kaikeyi. Even as Kaikeyi is about to partake of the payasam, Dasaratha is called away. Kaikeyi knows that Dasaratha has not given any payasam to Sumitra. Kaushalya also suspects the youngest queen has been left out. Both Kaushalya and Kaikeyi go in turn to Sumitra, and give her portions from the payasam that the king left with them. Thus, although the King her husband gave Sumitra no payasam at all, she gets to have two portions of it, courtesy of her co-wives; she therefore becomes the mother of not one but two sons. Queen Kaushalya gives birth to the eldest son, Rama; Bharata is born to Queen Kaikeyi; and the two sons born to Queen Sumitra are the twins Lakshmana and Shatrughna. The king and his wives are overjoyed, and the entire kingdom celebrates the arrival of four handsome sons. What none of the royal family realizes, of course, is that Rama is the newest incarnation of the god Vishnu, who comes to earth every so often to restore balance. His brothers are incarnations of various tools and attendants of Vishnu. Together, they will fight and overthrow a great evil that threatens to leave even heaven itself in smoking ruins. “Spells and Weapons.” When King Dasaratha’s four sons reach adolescence, a visit from the wise yet impetuous sage Vishwamitra causes quite a stir: he has been attempting an important sacrifice in the forests near the kingdom, but rakshasa demons continuously interrupt him. Though the king is at first reluctant, he finally allows his sons Rama and Lakshmana to accompany the warrior priest, who teaches the teens how to utilize powerful spells and celestial weapons to defeat the demons. In this way, Rama, avatar of the god Vishnu, begins the training that will eventually allow him to overthrow the demon king. “The Broken Bow.” After Rama and Lakshmana have overcome the demons who opposed his sacrifice, Vishwamitra (rather than sending the princes home) takes a side-trip to the nearby kingdom of Mithila, where Sita, the only daughter of King Janaki, is about to undergo her Swayamvara: the ceremony at which a crowd of suitors strive to prove their worth to her in hopes that she will pick one of them as her husband. The challenge for these bachelors is to string the bow of Shiva and shoot an arrow with it. This task is considered impossible for any ordinary man: we’re talking about the personal weapon of Shiva, more powerful and holy than any other. Most suitors cannot even lift the mighty bow from its resting place. Young Rama, not yet 16, seeing Sita for the first time is utterly smitten. No words are needed: when their eyes met, everyone else fades into nothing. For, you see, Sita is the incarnation of Lakshmi, Vishnu’s eternal consort, and while neither of them remembers their previous existences as gods, their essence calls out to each other. For Rama, the decision is simple. He steps to the bow and, to the amazement of all, lifts it with relative ease. While attempting to string the bow, in fact, Rama breaks the weapon in two. This feat of strength spreads his fame across the worlds and seals his marriage to Sita. 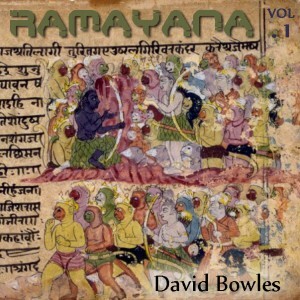 “Bitter Boons.” Though she loves Rama as her own son, King Dasaratha’s second wife, Kaikeyi, looks upon the firstborn son with certain sinking dread. Her own father exiled her mother when she was little, and well she understands how fickle men, even kings, can be. When Dasaratha announces his intention to crown Rama prince regent and step down from the the throne, Kaikeyi is a little shocked. She knows Rama is Dasaratha’s favorite, but many years ago, when he married her due to the barrenness of his first wife, Rama’s mother Kausalya, Dasaratha promised Ashwapati, Kaikeyi’s father, than her son would rule the kingdom of Kosala. Her wicked nurse, Manthara, who has been feeding Kaikeyi’s fear of rejection for years, urges her to use the two boons that the king granted her years before when she saved his life on the battlefield. She’s been saving up those wishes for a time she really needed them, and now Manthara tells her exactly what to demand. Not knowing how literally she is about to break the old king’s heart, Kaikeyi stands before him and demands her boons: first, her son Bharata will be crowned prince regent; second, Rama must be exiled for 14 years, long enough to ensure that Bharata’s hold on the kingdom is secure. Everyone is appalled at her demands: the king falls to his knees, begging her to retract them; her own son spits in her face; her sister wives weep bitter tears. Only Rama kisses her gently, saying it is his dharma to obey, affirming that he loves her, calling her mother. He insists that the king be guided by dharma: his word has to be upheld, his promises kept. As Kaikeyi’s plans for her son wreak havoc around her, she shudders at the destructive power of those bitter boons. “Death’s Silver Noose Slipped Round His Soul.” Dasaratha has lost the will to live after being forced to exile his most beloved son, Rama. As the king lies beside one of his wives, blinded by his own grief (and understanding that his own violation of dharma has brought the end upon him), Lord Yama, death personified, quietly enters the room and slips his silver noose around Dasaratha’s soul, drawing it carefully out and bearing the ghostly homunculus away to whatever awaits us all, out there, beyond. “Peace in the Vindhya Hills.” Upon his exile from Ayodhya, Rama (accompanied by his wife, Sita, and his brother Lakshmana) travels to the forests of Chitrakuta, among the Vindhya Hills. They spend 11 of the 14 years of their banishment in this beautiful place, ascetics in search of truth amidst nature’s bounty. “His Sandals Wait Before the Throne.” Rama has graciously obeyed Queen Kaikeyi’s wish for his banishment, understanding dharma better than anyone in the epic, and has taken his wife and half-brother Lakshmana into the forest to live as ascetics with him. Though his exile precipitated his father’s death, Rama does not return to the land of his birth during the 14 years that Kaikeyi has asked for him to remain away. Bharata, who was away during this tumult, arrived to discover his mother’s reprensible actions; horrified, he raced after Rama–accompanied by most of his new subjects–and begged him to return to Ayodhya, their city, and rule as was his destiny. Rama refused, pointing to the demands of dharma. Once Bharata saw that his brother would not return, he begged of him a gift: Rama’s sandals. Bharata explained that he would only act as a temporary regent during the 14 years of Rama’s exile, governing not from Ayodhya, but a nearby village. On the throne of their kingdom he never sat, but instead placed the sandals of its rightful lord before it, awaiting his return. For a decade and a half, those sandals will occupy that symbolic place of authority, awaiting the return of their owner… The first movement is Bharata’s song of longing, which is echoed in the second movement by the common people of Kosala in the second movement, and finally by the entire world. 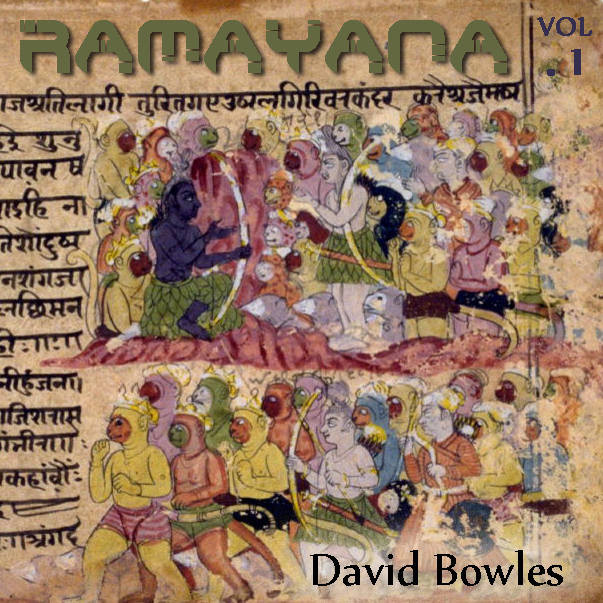 Then the composition moves to Rama, living a hermit’s life in the Ayodhya Hills with his wife and brother Lakshmana; he hears his people’s lament, and his kingly theme emerges from the contemplative silence, a promise of his impending return. “Surpanakha’s Lament.” Surpanakha (a rakshasi or hideous, man-eating demon) is the sister of the demon king Ravana. During Rama’s exile, the demoness falls in love with that handsome incarnation of the god Vishnu, but he rejects her (pointing out he’s married) and jokingly recommends his brother, Lakshmana (who mockingly rebuffs her). When Surpanakha angrily attacks Rama’s wife, Lakshmana cuts off the rakshasi’s nose; the demonness slinks off to her brother, ready to start a war. This piece features the guitar work of Matt Granz. “Rama Slays the Dandaka Army.” After Surpanakha’s humiliation at the hands of Rama and Lakshmana, the demonness rushes to her uncle, Khara, general of the rakshasa army in the province of Dandaka, which borders the Vindhya Hills and Chitrakuta. Enraged, Khara brings the whole of his might down upon the exiles, an army of thousands… but Rama, using the divine weapons he was given access to as a teen, quickly wipes out the rakshasa forces, beheading the general at the end. Rama has no inkling that this battle is the harbinger of a coming war. “Caves of Kishkindha.” After Prince Rama’s wife Sita is abducted by Ravana, king of demons, Rama and his brother Lakshmana begin a desperate search that takes them into the kingdom of Kiskindha, a mountainous forest land dotted with enormous caves in which live the vanara, humanoid simians with the gift of speech (often called “monkeys” in English translations because of their tails… interestingly, “vanara” appears to mean, in Sanskrit, “forest people,” so perhaps the legends about them were Arya stories about natives of the southern sub-continent). In any event, in the forest of Kishkindha, encounters the vanara king in exile, Sugriva, and Hanuman, one of his generals. By a stroke of luck, these are the two figures to whom Sita dropped from Ravana’s chariot her scarf and some ornaments. Sugriva was deposed from his kingdom by his brother, Vali, who also took his wife Roma from him. Rama agrees to defeat Vali if Sugriva will assist in the search for Sita. The agreement made, Sugriva challenges Vali to a duel. While the duel is progressing, Rama shoots from his bow and kills Vali. Sugriva regains his kingdom and his wife. Rama and his brother spend some time in the breathtaking caves of this simian kingdom, enjoying its hospitality before setting out with a vanara army to recuperate Sita.